The undersigned organizations enthusiastically support the Raise the Wage Act of 2019, as introduced by Senators Bernie Sanders (VT) and Patty Murray (WA), Representatives Robert C. “Bobby” Scott (VA), Mark Pocan (WI) and Stephanie Murphy (FL). Sunset the much criticized ability of employers to pay workers with disabilities a subminimum wage through certificates issued by DOL. 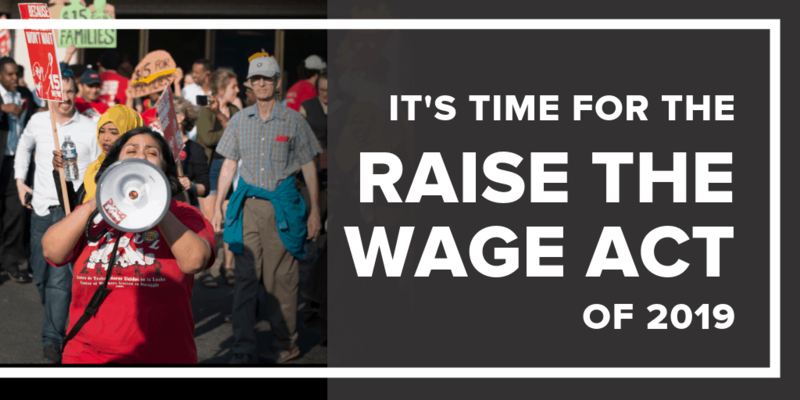 At a time when wage stagnation and income inequality pose serious threats to our families and our economy, the Raise the Wage Act of 2019 will begin to reverse that cycle and raise pay broadly across the bottom of the workforce. According to the Economic Policy Institute, this Act will deliver long-overdue raises to more than 1 in 4 workers, 90% of whom are over the age of 20. The average age of workers who would get a raise is 35, and nearly half have some years of college education. In fact, those who work year-round would see a raise in the order of $3,000 a year, which is enough to make a tremendous difference in the life of a preschool teacher, bank teller, or fast-food worker who today struggles to get by on around $20,000 per year. 28 percent are working parents with children, and half have family incomes of less than $40,000 per year. Women make up nearly 58 percent of the workers who would benefit from a $15 minimum wage, which would be instrumental in helping to close the gender-wage-gap. Raising the minimum wage to $15 would also significantly benefit workers of color, with 38 percent of African American workers and 33 percent of Latinos seeing a pay increase once this law goes into effect. These are the frontline workers who make America run—yet due to the erosion of the real value of the minimum wage over the last half century, they are struggling even as our economy enjoys a solid recovery. The time for the Raise the Wage Act is long overdue, and we cannot delay in working toward its passage. We call on Congress to enact this important piece of legislation as quickly as possible, and for President Trump to sign it when it comes to his desk. Congregation of the Infant Jesus Nursing Sisters of the Sick Poor,Inc. Men of All Colors Together (MACT)/Phila. Metropolitan Community Church of Washington, D.C.
South Carolina Christian Action Council, Inc.